A peeved Taslima Nasreen made displeasure over her returning to Mumbai even when she had flown down to Aurangabad known on Twitter where she wondered how her itinerary of the trip got leaked and the members of the All India Majlis-e-Ittehadul Muslimeen (AIMIM) took to the streets to protest against her visit, even as the police claimed they were unaware until an hour of her arrival. Nasreen even rued the fact that this happened in, perhaps, the largest democracy in the world. She tweeted, "I had a dream to visit Ellora and Ajanta caves. Can't believe it was not possible in the largest democracy in the world. Nobody but security police in Aurangabad was informed about my itinerary & hotel booking. I wonder how fanatics got to know everything!" I had a dream to visit Ellora and Ajanta caves. Can't believe it was not possible in the largest democracy in the world. Nobody but security police in Aurangabad was informed about my itinerary & hotel booking. I wonder how fanatics got to know everything! Following her tweet, the police have launched a probe into the security breach. What makes this even more tragic is this isn't the first time that Nasreen has faced bullying from fundamentalists in India. This incident also comes in the wake of numerous episodes of mob lynching and violence, which the Lok Sabha debated over on Monday as well. In protesting against the controversial Bangladeshi writer, the AIMIM is certainly catering to its electoral constituency, but the party's locus standi under the circumstances of India is still under question. Nasreen was sent back to Mumbai from an Aurangabad Airport after protests broke out outside the airport premises and the hotel she was supposed to stay in, on Saturday. The protests were reportedly orchestrated by AIMIM legislator Imtiyaz Jaleel. 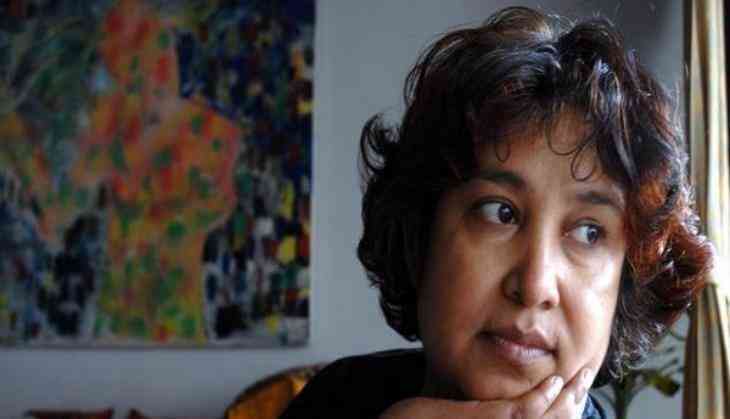 The protestors shouted "Taslima Go Back" after Nasreen landed at Aurangabad's Chikalthana Airport on Saturday evening. The police, fearing a breakdown of law and order in the area, asked her to stay inside the airport. They then asked her to return to Mumbai, to which she agreed. Jaleel, the MLA from Aurangabad central constituency, reportedly carried out the protests as he said that Nasreen's writings have hurt the religious sentiments of the Muslims across the world. Nasreen, now a citizen of Sweden, has been living in exile ever since she left Bangladesh in 1994 in the wake of threats to her by fundamentalist groups. The Indian Home Ministry had extended her visa for a year, with effect from July 23.